Although we stock the most extensive inventory of door hardware on the web, occasionally even we don't have something. If we don’t have what you need, we’ll order it. All of our special orders receive top-quality customer care and attention. 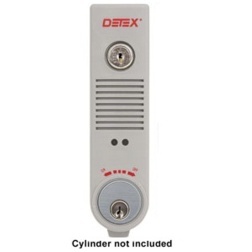 Detex - MC65 Mortise Cylinder 1-1/8"
The V40xEE, designed for primary and secondary exits, provides a secure 15-second delay and a 100dB alarm. This Detex V40-48-628 is a special order weather resistant rim exit device for primary and secondary exits and exterior gates where a panic device is necessary. Detex 14BN-689 Lever trim for V40-EB exit device. Passage lever trim. No key or cylinder, lever always active. The 20xW Series surface vertical rod exit device is super-heavy-duty panic and fire exit hardware for use on all types of double doors or gates without a mullion that are or may be exposed directly to the weather. This Detex UL Weatherized rim exit device with Passage lever trim, standard duty rim exit device. Its exterior is made of anodized aluminum and damage and corrosion resistant ABS. This Detex UL Weatherized rim exit device, standard duty rim exit device. Its exterior is made of anodized aluminum and damage and corrosion resistant ABS. The Detex 03AN night latch function pull is for Detex Value Series-V40/V50. Night latch function, key retracts latch. Entrance by knob or lever only when released by key. Key removable only when locked. 1-1/8" Mortise cylinder required - not included. This Detex EAX-300 is a door propped alarm that is powered by a standard 9 volt battery battery. It is used in applications where the doors may be used for exit or entry, but may not be held or propped open. The alarm will st||op ringing as soon as the door closes. Detex Series 81-800 logic and power supplies convert 120VAC into regulated and filtered 24VDC, providing a secure, consistent, power feed to various electrified door hardware accessories, primarily access control components, such as Detex latch retraction exit devices. The Request to Exit High Current switching option, can be used to control power to a device that requires higher current up to 2.0 amperes; such as an electro-magnetic lock, electric strike or motor. The Detex EAX-411SK AC/DC powered door prop alarm provides a unique solution to the common security challenge associated with doors that are propped open. Exit alarms are designed for applications requiring an alarmed exit on secured doors. The Detex EAX-2500SK is a self-contained door alarm that sounds to warn of a unauthorized use of a emergency exit or restricted door. Detex V40 Weather resistant rim exit device. Fits standard 1-3/4" - 2-1/4" thick wood, hollow metal, fiberglass or aluminum doors. The Detex EC2 ia a flush end cap for advantex exit devices. The Detex V50EB Surface Vertical Rod device is designed for primary and secondary exits that require an alarmed surface vertical rod exit device. The 100dB alarm will sound when someone attempts to exit, alerting management to the unauthorized exit. The FV40xEM, designed for primary and secondary exits, provides a secure 15-second delay and a 100 decibel alarm when someone attempts to exit. This is a fire rated device. The V40xEM, designed for primary and secondary exits, provides a secure 15-second delay and a 100 decibel alarm when someone attempts to exit. The ECL-230X-TDB is a code compliant, battery alarmed, rugged 3-point dead bolt, panic device with photo-luminescent sign providing maximum security and a 100 decibel alarm for secondary exits. Detex V40-EH-LBM hard wired Alarmed rim exit device with Latch Bolt Monitoring. Designed for primary and secondary exits that require an alarmed panic device. Alarm will sound when someone attempts to exit,alerting management to the unauthorized exit. Fits standard 1-3/4" - 2-1/4" thick wood, hollow metal, fiberglass or aluminum doors. The Detex V50 Surface Vertical Rod device are heavyduty panic and fire exit hardware for use on all types of double doors without a mullion. DETEX has its origins in a predecessor company established back in the 1870's. The original company - A. A. Newman, manufactured and sold stationary watchclocks – used for managing guard tours. Detex remained principally a manufacturer and distributor of Watchman's Clock Systems until 1963, when it introduced a new line of security hardware products and entered the builder's hardware field. These products are designed primarily for use in the control of exits in industrial, commercial, institutional and educational buildings. QualifiedHardware.com carries an extensive line of DETEX products to satisfy the diverse needs of these facilities. The DETEX product line includes the classic ECL-230D and ECL-600 exit control locks, the V40 & V50 Value Series exit devices with an alarm option for securing exterior doors, and the EAX family of door alarms that includes the EAX-500 and EAX-2500. QualifiedHardware.com is proud to carry DETEX locks, alarms and accessories with a comprehensive inventory at competitive prices. QualifiedHardware.com offers free shipping within the Continental US for all DETEX products.